Likes and Followers mean nothing if your community is not engaging – period. Creating a Facebook, Twitter, and Instagram page for your brand is a great step into current day marketing; but they serve no purpose when your community is silent. I’ve put together three secrets to creating an engaging fan base and hope it helps you elevate your online community. The first secret is to promote engagement. That’s right – tell your followers that you want to speak with them. You’d be surprised how well this works. Are you using brand hashtags? If not, maybe that’s something you’d want to consider. Let’s say you’re selling a product – maybe you can include a note with each purchase. You may want to thank your customer, tell them how much you appreciate their business, and include a brand hashtag. Hashtags help organize content relevant to your brand and serve as the gateway you need to find customers online and start conversations. The second secret is to give back. You may decide to run a contest or give something away, but that’s not the only way to give back. We give back on behalf of our clients by providing value to their target audience. Maybe you’re working at a car dealership and need to push a few more sales before the end of the month. Instead of spamming your followers with posts asking them to make a purchase, educate them and feed them valuable content that they’ll genuinely be interested in consuming. Reverse the roles, take a step back, and ask yourself if your content would make you excited as a customer. The third secret is to continue innovating. Don’t create social media pages and then hit the brakes once you reach your first goal. Keep pushing, keep growing, and keep moving to the platform that makes sense for your brand. I am blown away to see how many brands are targeting millennials and missing the boat on Snapchat. 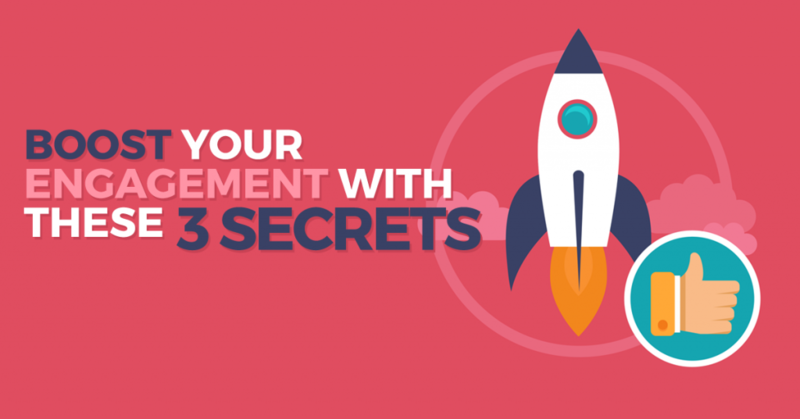 Now, these “secrets” may seem pretty obvious as you read them, but are you following them? Look at your content calendar and make sure you’re sharing information that matters to your community — not just you. Take another look at your latest post and see if you actually opened the door for engagement – or did you just expect it? Think of your brand as a car and engagement as the fuel. You need engagement to keep growing, especially on social.